January 3, 2011 - International airline passengers, under the Montreal Convention of 1999 ratified by the U.S. in 2003 (and which replaced the Warsaw Convention), now have legal rights that are in some ways superior to the rights of passengers on U.S. domestic flights. 1) Airlines are liable for damages caused by delay in the transporting of passengers or cargo up to $6,640, unless the airline proves that it took all reasonable measures to prevent the damage caused by delay or that it was impossible for them to take such measures. 2) For lost or damaged or delayed baggage, the airline liability is generally limited to $1,640 per passenger, unless the passenger has handed the airline a special interest declaration and paid any supplementary fee. No airline is permitted by contract to assert lower liability limits for international air travel than those provided for in the Montreal Convention and any such contract terms are void. In general, state common law tort or statutory actions are now preempted, as most courts now view the Montreal Convention as the exclusive remedy for claims arising out of international air transportation. Legal actions on all claims must be brought within two (2) years of the incident. However, in addition, complaints to the airline for baggage damage claims must be made within 7 days, for cargo damage within 14 days of the date of receipt by the passenger. For baggage or cargo delay claims, the passenger must file a complaint with the airline within 21 days of receipt. Complaint to the airline must be made in writing and delivered or sent within the time limits or the claim is barred except in case of fraud by the airline. Courts that have jurisdiction for passenger actions against airlines under the Montreal Convention include US federal district courts and other courts where the passenger has his/her primary and permanent residence, where the airline is domiciled (incorporated) or has its principal office, the final destination location of the flight, or where the airline has a place of business through which the ticket was purchased. In The U.S. on April 29, 2010, the United States DOT band airlines from allowing aircraft to sit out on the tarmac with passengers for more than three hours. The consequence under this new rule is airlines would have to pay $27,500 for each passenger stuck for more than three hours on the tarmac. Consumer advocate groups who have worked hard to push for more airline passenger protections welcomed this new bill. 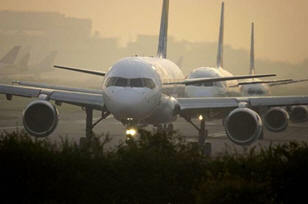 However, a number of airline executive were against this consumer protection law. Full text of the Montreal Convention. The US dollar amounts specified are based on the conversion to US dollars from the Special Drawing Rights units used in the Convention as of February 22, 2008. This conversion is posted daily on the International Monetary Fund web site. If you were stuck on a plane or in an airport: call FlyersRights.org hotline for free information and free help in filing a claim: 1-877-359-3776.